A week ago, the Chicago Bears surprised everyone by snatching a victory from the jaws of defeat, so to speak. 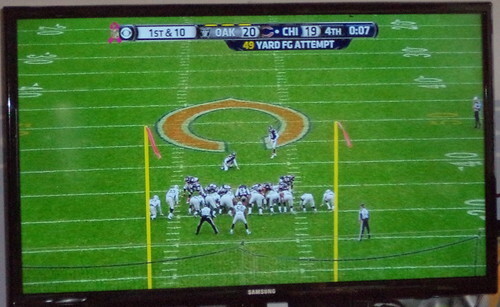 The field goal kicker kicked the ball through the uprights from 49 yards out. On September 26th, Marshall Koehn kicked a field goal to win the game for my Iowa Hawkeyes. Nothing unusual about a last second field goal to win a football game except the kick was 58 yards. If you know something about football, that's OVER half of the total yardage on the field. And when you look at both kicks, there was enough distance that they could have been kicked from 53 and 63 yards away, respectively. When did field goal kickers develop the ability to kick from downtown Iowa City? In the case of Iowa kickers, these are 18-22 year-olds doing this. Field goal kickers last longer than linemen or quarterbacks or defensive ends because they usually don't get attacked or find themselves called upon to tackle a opponent. But I remember a time when these kinds of distances were completely unheard of. If you had a guy who had a 75% make percentage from 40 yards out, you were golden. Against tough defenses, it meant you didn't have to get to the end zone to add points. Now days, 40 yard is expected. The longest field goal in NFL history is 64-yards done by Matt Prater of the Denver Broncos on December 8, 2013. The longest field goal in NCAA history is 65 yards, set by Martin Gramatica of Kansas State on September 12, 1998. Perhaps it's the changing game. Today's players are stronger. Their size, strength and agility is carefully monitored. Weight rooms, while a nice idea back in the 1980's, are high tech and every player is required to use them. Training and practice, even for kickers, is planned. I guess it would stand to reason that, as players get stronger, the ability to kick farther is a by-product of that conditioning. As much as a kicker being able to do these above distance kicks, the easy ones can become harder than usual. Koehn had a string of 59 straight point after touchdowns broken. The PAT is almost boring in it's regularity. Only freshman kickers would miss these. Um...not so much. Koehn, a 98% field goal kicker inside 30 yards, missed one each in Iowa's next two games after the 58 yarder. Just because he can nail the long ones doesn't mean he can get the short ones. And I saw this over the past weekend when I had football on in the background while I sewed. Pro kickers are just as prone to hooking a short kick or missing a point after touchdown as college kickers are. Perhaps the idea that you have a kicker who can make the goal from yards and yards away is a novelty. The bread and butter kicks are still the ones 40 yards and less and those are the ones you should be making. Still it's a marvel to me that teams make decisions based upon whether their kicker could make a field goal from 45+ yards away. I guess that's evolution for you. Bigger, stronger, more agile.